Happy almost Valentine’s Day! My name is Jen Causey and I’m the resident wedding expert for Cricut. 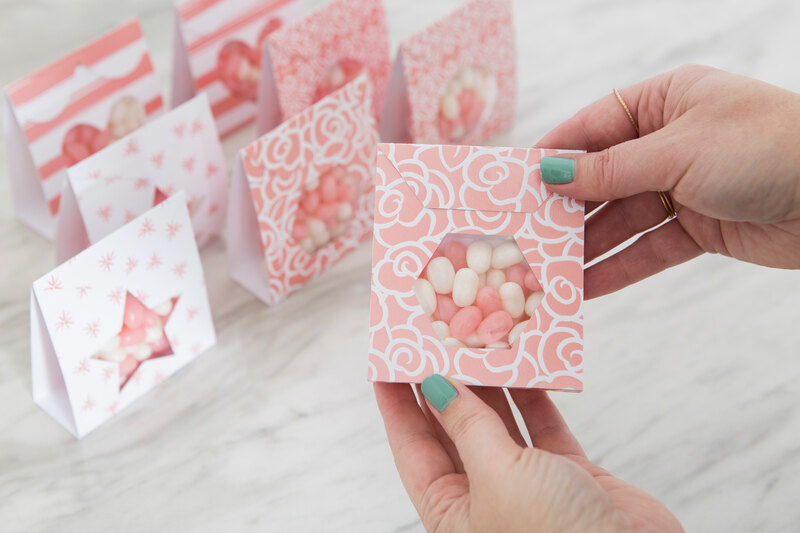 I’m the creative gal behind the wedding blog called Something Turquoise and one of our most popular projects for favors or small gifts are these candy treat pouches. 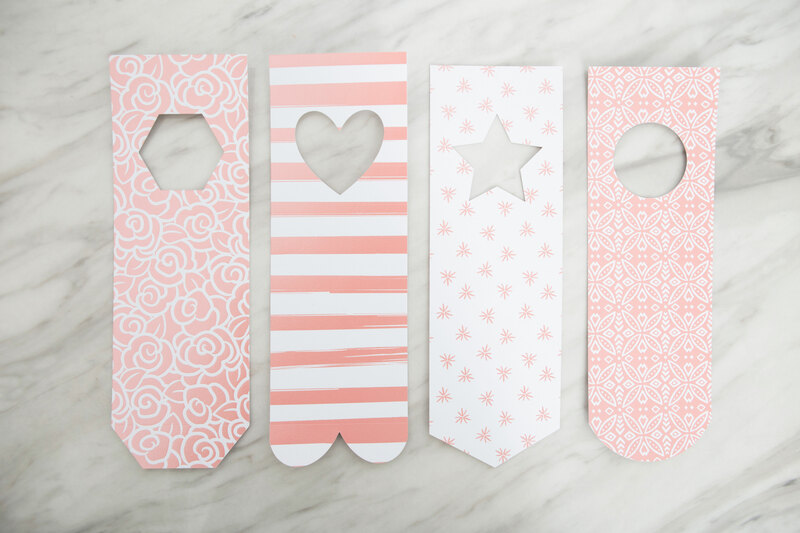 So, I decided to use Cricut’s amazing, Deluxe Paper to create 4 brand new designs that you can use for bridal shower or wedding favors, for Valentine’s, for kids treats or any occasion requiring a treat. 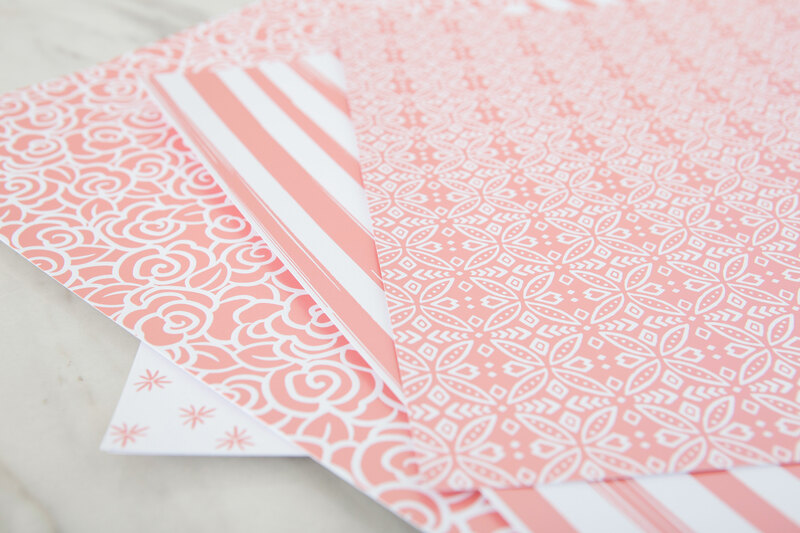 Since Cricut makes SO many different styles of deluxe paper, the theme can come straight from their papers. From superhero to modern graphics and from foil embossed to pearl - the sky is the limit! Here I’m using the new Foil Embossed Pink/White because I thought it would be perfect for weddings or Valentine’s Day. 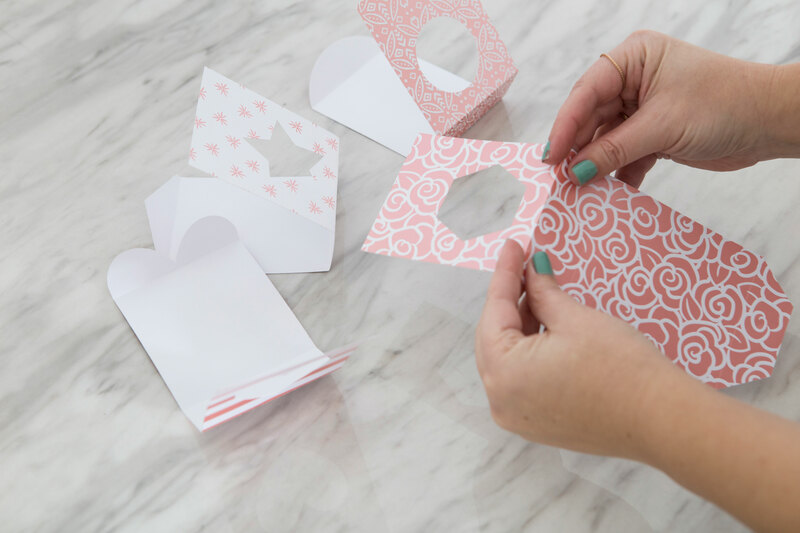 When making these treat pouches, you really want to use a sturdy cardstock like this or else they won’t hold their shape. 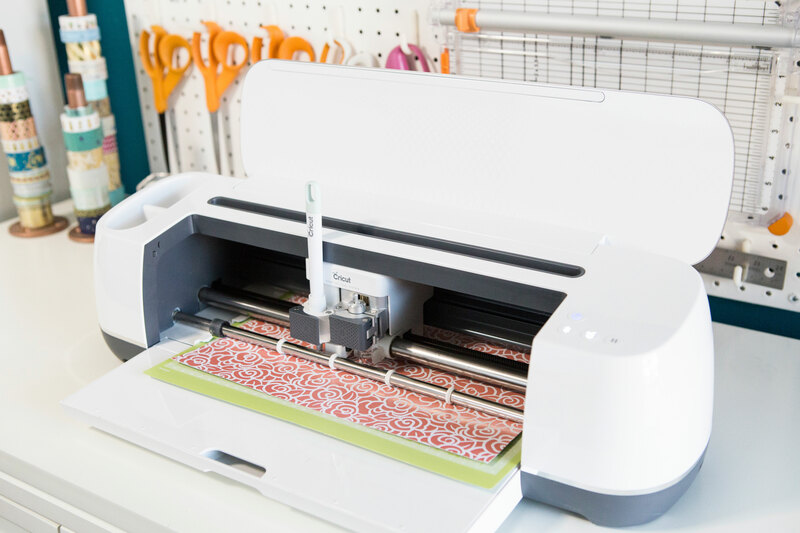 Let your Cricut work its magic! Visit this link to choose between my four treat pouch designs, choose your favorite or make all four. 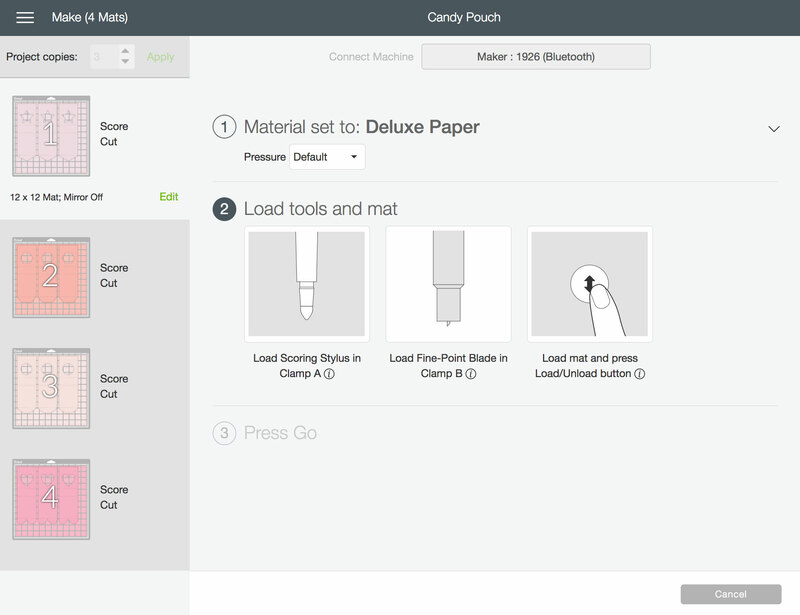 Set your material to Deluxe Paper and you’re good to go. There is a circle, heart, star, and hexagon. The scoring blade is essential for this project as it makes the folding step SO easy. 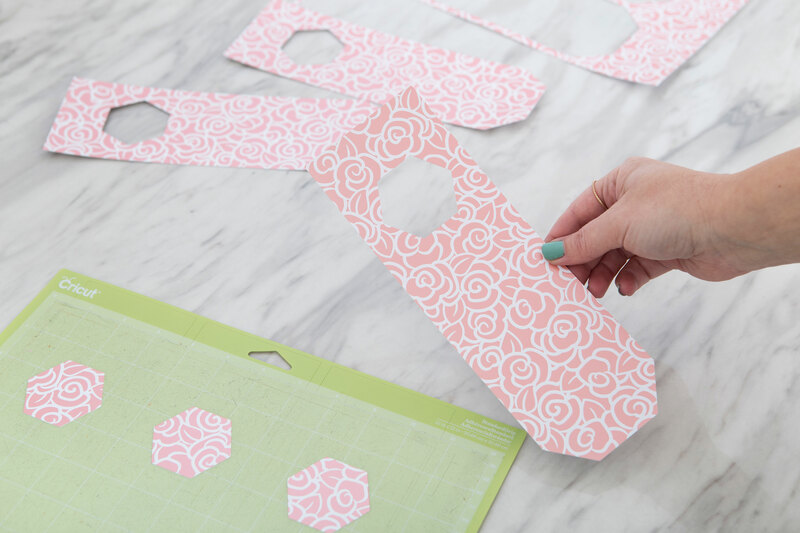 Carefully remove the cut pouches from the cutting mat and keep on cutting! 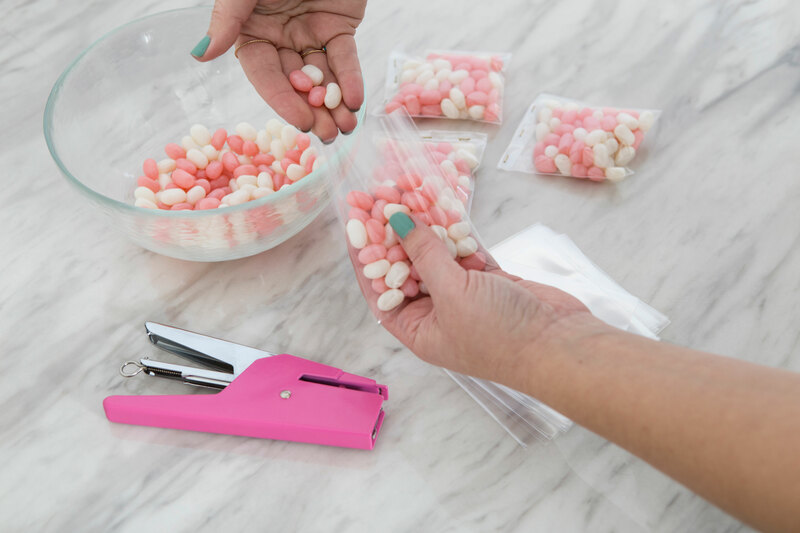 Fill your 3” x 4” treat bags about 3/4 full and staple to seal. Fold your treat pouches on the score lines. 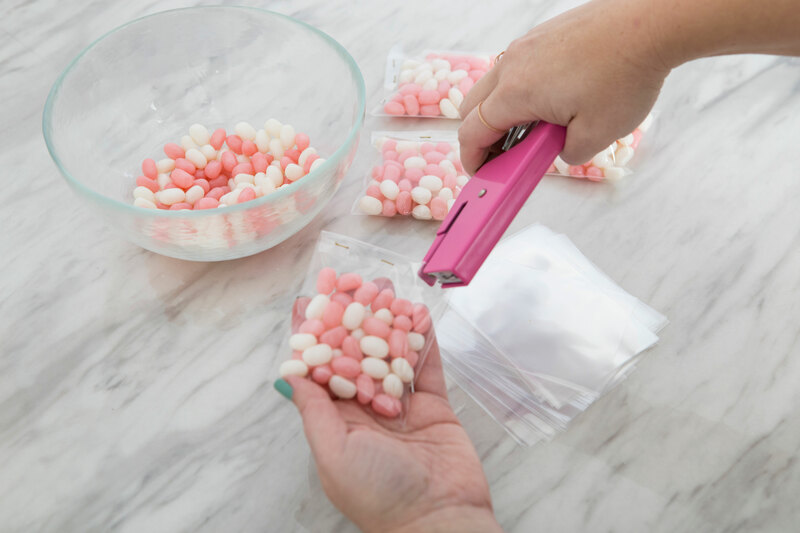 Then with the bottom of the treat pouch on the table, prop the candy bag inside, then staple to the front of the treat pouch. 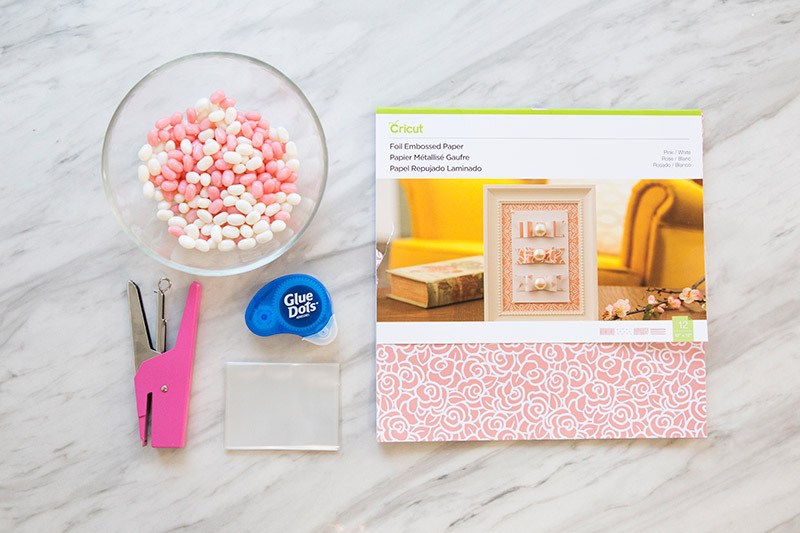 Add your favorite scrapbooking adhesive to the underside of the top flap and fold over to finish the pouch. Adorable and so easy! 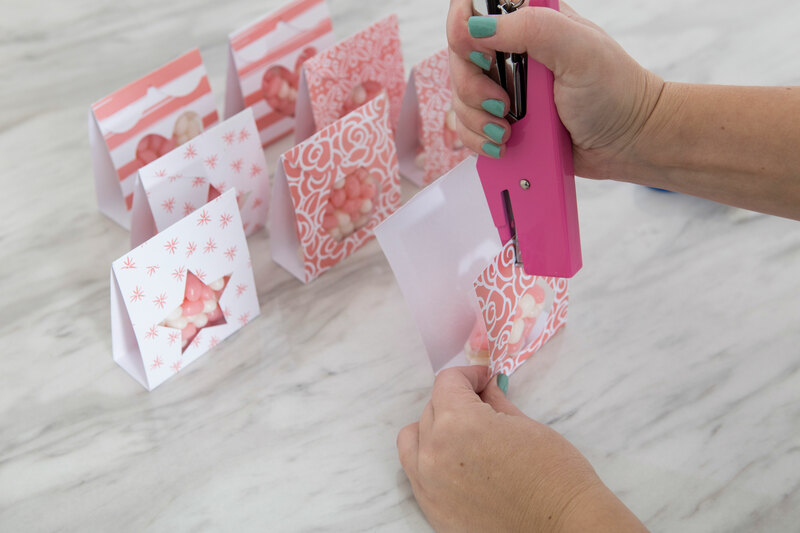 I’m excited to see you creative Cricut users create these treat pouches so make sure to share them on social and tag @something_turquoise and @officialcricut! 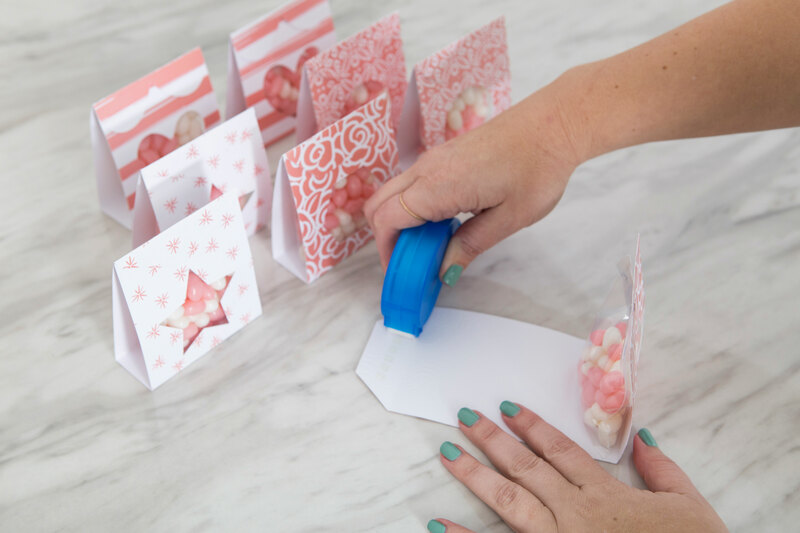 I have Cricut access but I can’t find these candy pouches. Where do I find them? Hi! The blogger included a link to her templates, which you can find HERE. I am new to cricut. I have only done vinyl. so do I need a different blade to make this? You can use the Fine Point blade for vinyl and a variety of other materials, including this project. For thicker ones, we have a Deep Cut blade. You can see a list of materials and which blade you will need by going HERE. 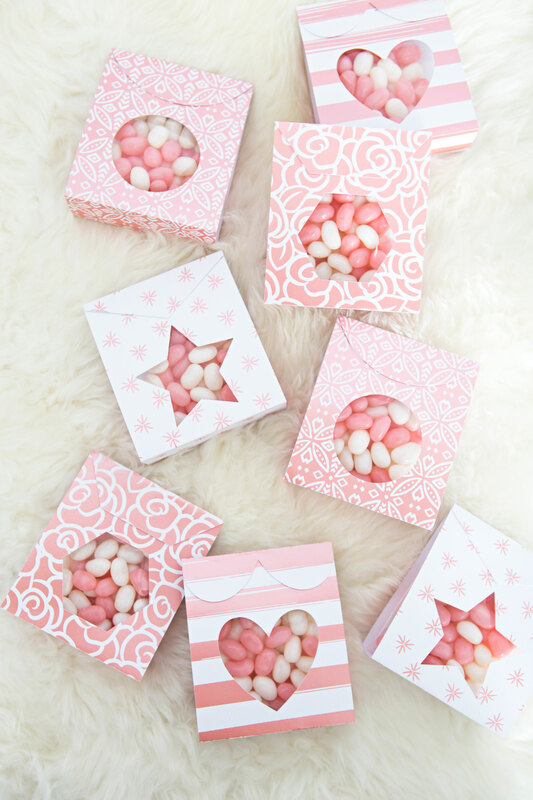 Where can the pink & white foil paper that was used for the Valentine candy pouch favors be purchased? I can’t find it on the website. Thank you! One place that you can buy this is at Joann Fabrics. The links do not bring you to the page. Is there a design number to search for? It just opens the link to design space. These are awesome & I would like to create these. However, the link or address above do not take you to the designs for this. As others have already stated both only take you to the Design Space app. The design is within Design Space. This is why it opens there. There are 4 designs to choose from. Click on the HERE link above to follow her tutorial. I am new; got my Cricut for Christmas, I only have my iPad to link with; how do I do that? Hi. You would need the app in the App store. Search for Cricut. Then you can design in there and send it to the Cricut for cutting. 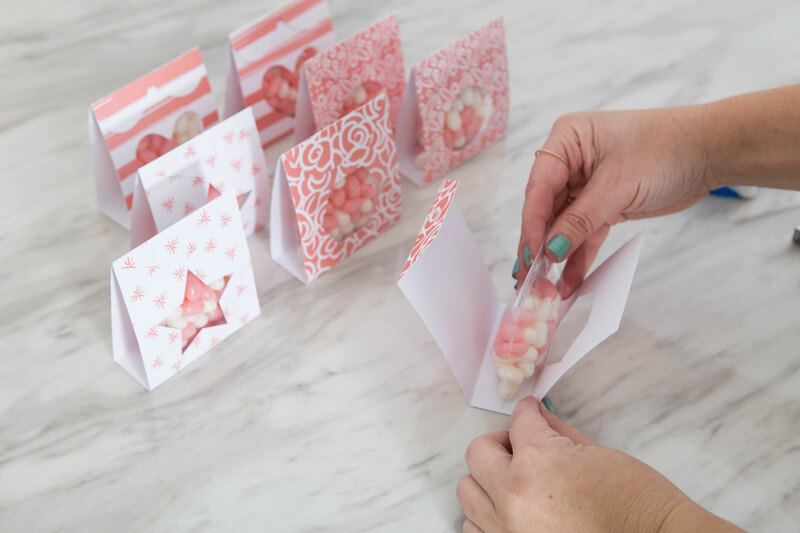 Pingback: Make these adorable DIY "diamond candy pouch" favors! 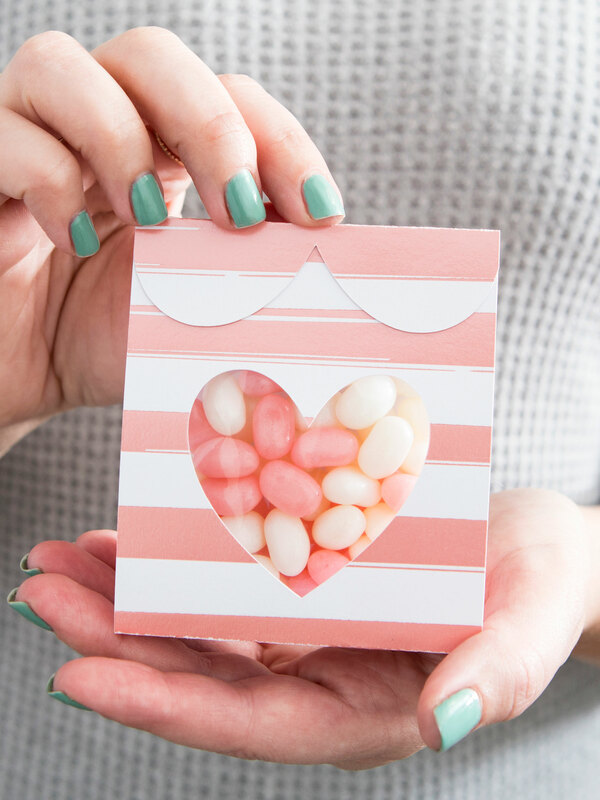 Pingback: How to make these adorable S'more Love wedding favors! 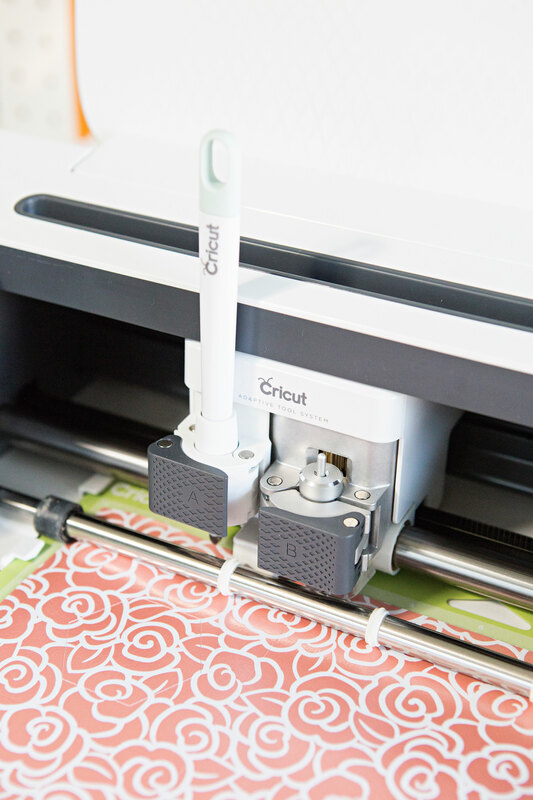 i wish you had the original design on cricut…. Sure, you can resize them to be larger. Click on the pattern, then use the toolbar or click and drag the blue circle at the bottom right.